Silent during winter. Utters loud croaks and harsh whistles on breeding grounds. Description: Sexes similar. Very large. 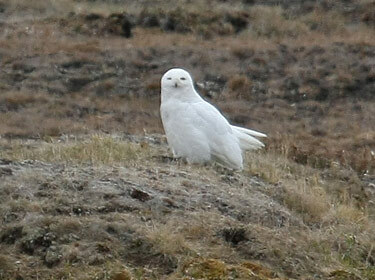 Almost entirely white, with gray-brown spotting above and light barring below. Round head; no ear tufts; yellow eyes. Females have more spotting. 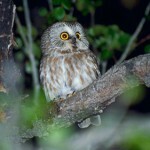 Juveniles are more heavily marked with brown. An old male may be completely white. 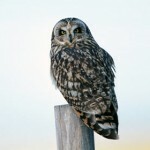 Habitat: Wintering birds found in open fields, plains, marshes, and grassy lowlands. Where in Nebraska: Often seen perching on fence posts or other elevated sites. Occasional winter visitor. Usually not seen every winter, but can occur anywhere in the state. Field Notes: An irruptive species, they depend heavily upon lemmings for food. 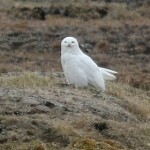 As the lemming population flucuates and food supplies get low, Snowy Owls then migrate south in large numbers. Fun Facts: They have feathers on their feet for extra warmth during the winter.